The first time I sat in a yoga class and they started to chant I felt the most powerful hit in my chest, almost like someone had thrown a force at me as the Om came belting across the room, it made me smile and I smiled for the rest of the day. The next time, I was prepared, only to be very disappointed as the chant was very long and slow and I couldn’t chant deep enough and had no idea how to adjust my voice or just let go of my self, I almost felt embarrassed. This oscillation between feelings of bliss and discomfort accompanied me to many yoga classes that I attended over the years. I am sure that it was my lack of self confidence and worth that had me feeling this way. If I didn’t sound perfect then I wasn’t going to belt out a chant just in case someone heard me. This may have stemmed back when I was a kid in high school and was encouraged by a few of my teachers, my Mum and some friends to try out for the school musical. I really had no idea what I was in for and was so self conscious that when it was my turn to stand next to the piano with one of the music teachers, this squeak came out of my mouth and I just shut down. Naturally, they didn’t want to completely embarrass or discourage me so I was put in the chorus so my poorly developed voice, self esteem and singing skills could be blended with all of the others that couldn’t naturally sing or just wanted to hang out with a few friends and skip a few classes. Luck had it that I attended the World Yoga Conference in Sydney in 1996. It was put on by the Satyananda Yogis to bring about continuity and coalescence to yoga world wide. There was one stand out event that stayed with me, and that was being part of a 3,000 plus group of yogi’s chanting the Hare Ram mantra. Prior to that I had no experience of kirtan...it was an inspirational few days and for me, began a love affair with kirtan. After that I took a little sabbatical at the Mangrove Ashram (5 days) and cried through every kirtan that I attended, it was the most moving and inspirational practice that I had experienced. It changed my yoga for ever, it actually changed me forever. I came to realise, through direct experience, that chanting is not about how you sound, its about energy and how you feel. Its about focus and being in the moment, all those things that yoga practice teaches us through the synergy of asana, meditation and relaxation. 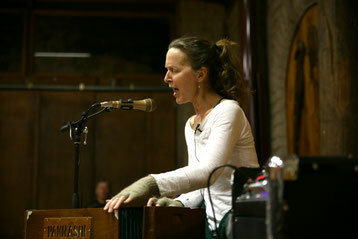 And despite all of that, for some of us, kirtan gifts us a complete union with our heart and inner sanctuary. Chanting heals from the inside out, from the heart to the mind and the body. I love that yoga offers so many ways for us to get to know ourselves and to break down the barriers that we set up between us and the rest of the world. Chanting keeps me very grounded and at the same time it lifts me up to heights of ecstasy that no other practice has offered me consistently. So the next time that you are in class or anywhere that you may be offered an opportunity to chant, I say smile and chant and know that you are opening your heart.